Dubai is the destination of dreams; for most people, their first ever holiday destination is Dubai. It is easily accessible, truly international, somewhat affordable, really luxurious, lavishly appealing and highly amazing! Over the years, Dubai has evolved so much that someone who has visited it a decade ago will not be able to recognize the Dubai city of today. The city has an astounding nightlife – partly thanks to the scorching heat of the day. International tourists who are not accustomed to the high temperatures of desert day prefer to explore the city during the night; so the city pretty much stays awake at night to offer enough appeal to these tourists. You must have done bowling in your home country and you are thinking why should I be spending money on doing the same thing in Dubai? Wait, there is a reason: the world-class bowling centers in Dubai give you a posh bowling appeal with their unique charm. You will never understand what we are talking about unless you have been inside Dubai International Bowling Center or Dubai Bowling Center at night. It is a must-visit place if you are visiting Dubai with friends; even if you are alone, hop in and you will be greeted by a lively crowd. The best thing about Dubai is that no two cafes in the city are alike; each one of them has something special and significant about it that makes it different from the others. Based on what you want to tantalize your taste buds with and where you are staying, there are always bound to be several startling cafes around you. If you are eager to try the best, then do visit Armani Dubai Café, The Espresso Lab or Arabian Tea House Restaurant and Café. Step out from your hotel room and try one before winding up the day. There are plenty of bars with live music that you can try. This is a great choice if you have spent a tiring day enjoying sand dune bashing then just rewind your exhausted muscles with some soothing time in a bar listening to the local artists performs. Contrary to your expectations of Arabian music only, Hard Rock Café plays some extraordinary rock and roll. Also you can try Jazz @ Pizza Express. Another bar that is very renowned with the tourists is Barasti Beach. The hi-fi cinemas of Dubai have all the world class facilities; latest international movies are always hitting the cinema so if you want to relax with your spouse or family, then check the movies that are playing in the nearby cinema and enjoy a thrilling audio and video quality along with the perfect ambience. Novo Cinema is spread in various exotic locations throughout Dubai and all their cinemas are super alluring, so try the one nearest to you. Obviously if you want to go for buggy tours then you are going to do the main recreation during the day, but this does not mean that desert safari is only limited to day time. In fact Arabian Nights are more enthralling than the fairy tales make you believe. How about having your own tent for sleepover in the middle of desert? Before you go to sleep, you can have the most scrumptious BBQ while you watch a belly dance performance. The perfect combination will be to spend the day having one-of-a-kind quad biking in Dubai with Just Gas It and for the true Arabian Desert adventure, lay down for stargazing in desert and observe the countless stars. Notice the natural beauty of desert, which is something that you cannot spot in the hustle and bustle of the city. Have you wondered how amazing the city looks from the top? Reach the top of Burj Khalifa and go to the observatory deck; from there you can see the city skyline which exceeds all expectations. Skyview bar also has a superb view where you can have light refreshment while praising the view. Another competing and equally impressive places are Uptown Bar and 360 Lounge. 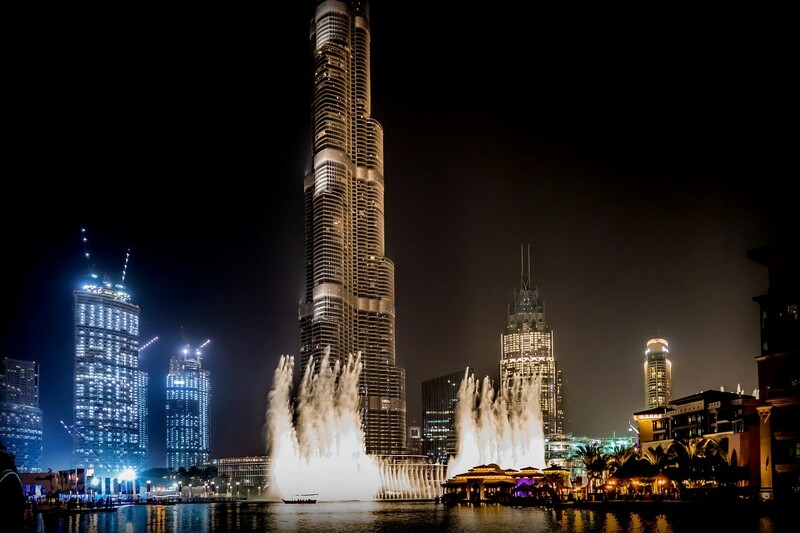 The best thing about Dubai Fountain is that while you are shopping (or even window shopping) in the mall, you can easily step outside to see the breath taking dancing fountain show after every half an hour. The fountain show runs between 6pm till 10pm, and till 11pm on weekends. There is a new tune each time. You can dine at Zeta or Margaux to have your dinner while you see the fountain show. While you are in Dubai, make sure to enjoy each day and each night. Do not just go to sleep, instead make each and night count because there is so much that the city has to offer!